In New York City’s Battery Park stands a tortured symbol of hope and resilience. 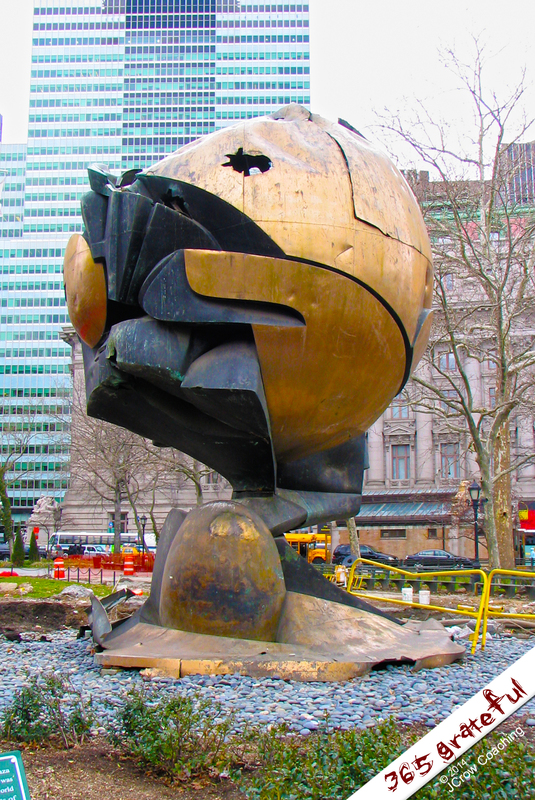 “The Sphere” stood for some 30 years in the plaza between the twin World Trade Center towers in Manhattan. Artist Fritz Koenig created it as a symbol of world peace. On September 11, 2001, it was severely damaged by the ravaged towers and the debris from the airliners that, as an act of terrorism, were deliberately crashed into the buildings. Yet that act could not destroy this resilient spirit of peace; it was resurrected, although not restored, its damages bared for all to see. Tonight, on the eve of the 13th anniversary of that terrible moment in history, I’m strangely comforted by the sight of that tortured symbol in my photo files. Who and what we are is formed by how we face the world and by how we live beyond what hand the world deals to us. Here, there is surely hope, captured and held aloft by twisted metal that simply would not be destroyed. That is an awesome memorial. Grateful for resilience, tonight. Yes, may we never forget, but, oh, may we always work for peace.